A re-classification as southern mountain caribou into its own sub-species has resulted in a recommendation it be considered endangered. Dec. 2, 2015 12:00 p.m.
Caribou are released from the maternity pen north of Revelstoke earlier this year. A recommendation is set to go the Minister of the Environment to have mountain caribou listed as an endangered species, the Revelstoke Review has learned. Stephen Hureau, a scientist who works on species at risks with the Canadian Wildlife Service branch of Environment Canada, told the Review that a new classification that separated southern mountain caribou from its previous larger population unit indicates the species is endangered in the Columbia and Rocky Mountains. Prior to the re-classification, southern mountain caribou were included as part of a larger population that ranged through much of southern and central B.C., and was only considered to be threatened. The move follows a recommendation made in May 2014 by the Committee on the Status of Endangered Wildlife in Canada (COSEWIC) to classify southern mountain caribou as endangered. Hureau said they consulted with local and regional stakeholders and will make a regulatory impact assessment that will go to Catherine McKenna, the new Minister of the Environment. She will decide whether or not to introduce legislation changing the southern mountain caribou’s status to endangered under the Species at Risk Act (SARA). The news won’t come as a big surprise to those familiar with the southern mountain caribou. Two major herds near Revelstoke have seen their numbers decline precipitously in the past 20 years. According to the SARA registry, the Columbia South herd, which ranges near Revelstoke, declined to only seven animals in 2013. The Columbia North herd had 183 animals in 2013. The southern mountain population now has 1,540 animals, according to SARA. Of 19 herds being tracked, three are considered gone, 12 are decreasing in population, three have stable populations, and only one – the Narrow Lake herd in the Upper Fraser valley – is increasing in numbers. Five herds have less than 10 animals left. 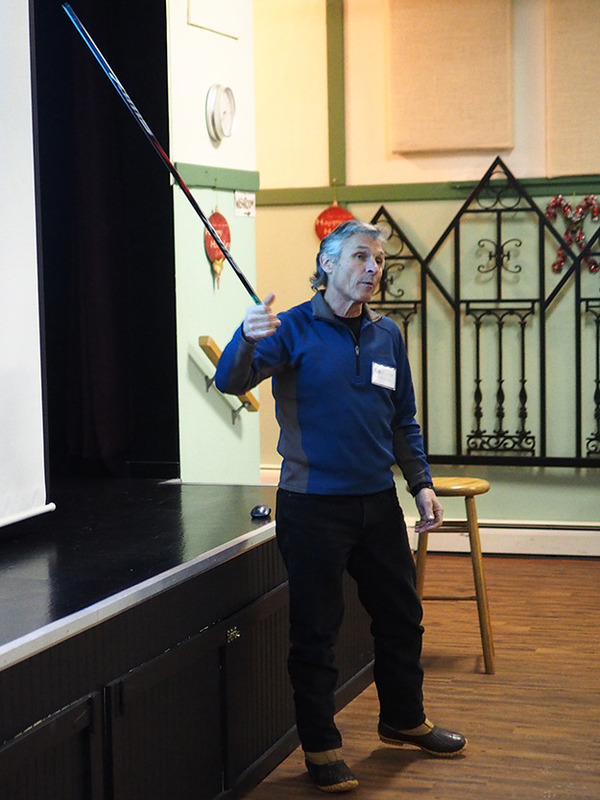 PHOTO: Stan Boutin, a scientist at the University of Alberta, discusses caribou research at a gathering of researchers in Revelstoke last week. The situation has resulted in numerous efforts to stop the decline and hopefully stabilize and even increase caribou populations. Last week, a group of researchers gathered in Revelstoke to share their research and have it examined by Stan Boutin and Evelyn Merrill, two scientists from the University of Alberta. Boutin and Daniels gave an overview of their analysis at a public information session last Wednesday, Nov. 25. They said habitat protection and restoration was key, but focused their presentation on population management projects, including primary-prey reduction, predator production and maternity penning. One project, led by Revelstoke researcher Rob Serrouya, involved reducing moose numbers in the area of the North Columbia herd. With liberalized hunting regulations, the moose population was reduced to about 300, from 1,500. That, in turn, led to a decline in wolf population. The caribou population was stable over the course of the experiment, but Boutin was cautious in praising the results. “It certainly didn’t hit the home run we hoped it would in terms of popping these populations back up in number,” he said. He said it will take time for data to come in from the wolf cull to determine the results. His general conclusion was that recovery efforts needed to focus on a combination of the above strategies. “We haven’t hit any home runs by any means,” he said. “Maybe we have to have that pen set up with some local predator control to get these little guys up to an age where they’re virtually invulnerable to predators. He said they would be producing a more detailed report in the future. There are various recovery strategies being implemented. The province introduced its recovery strategy in 2007 and the federal government produced one in 2014, however numbers continue to decline. The federal strategy calls for the southern mountain caribou population to be increased to 2,500. It lists predation as the biggest issue, while habitat protection is also a concern. Stephen Hureau said the reclassification of the species to endangered wouldn’t change things on the ground. Hureau said they are working on mapping caribou habitat. There is fear amongst local forestry companies that the federal government will recommend closing most of the timber harvest land base to logging, however it would be up the provincial government to implement any recommendations on Crown land. He said the mapping would be released to the public in 2016. The Federal government has also committed to creating an action plan by the end of 2017. “We don’t have an identifiable planning process but we are working with some partners to get people together to talk about what needs to happen on a more local or regional level to talk about the most endangered herds in the southern mountain population,” he said.